In this work a meta-analysis regression was performed to review 18 primary studies which were carried out between 1985 and 2017. 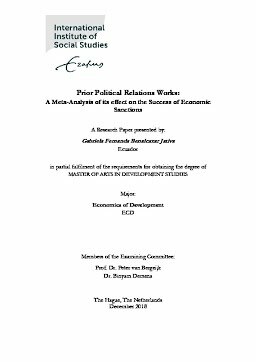 These studies included a total of 60 empirical esti-mates of the impact of prior political relations between sender and target countries on the success of economic sanctions. The aim of this research is to find if there is no bias in the empirical studies. If a bias exists, then we intend to look for the ‘true effect’ of the prior political relations and which ones are the heterogeneity factors these publications count for. Our results showed that these primary studies have indeed a publication bias. In addition, prior political relations impact positively with a ‘true’ effect of 0.139 in the success of eco-nomic sanctions. The heterogeneity factors of the empirical studies include the following: if prior political relations variable was calculated as a dummy, control variables (duration, US, distress, no institutions, military alliance, GNP ratio, the interaction between international institution and cooperation, and knights) and the number of study citations in every publica-tion.